Novel instruments come and go; futuristic ideas appear in demos, wow crowds, and then vanish just as quickly. In order to really become part of musical practice, they require practice. 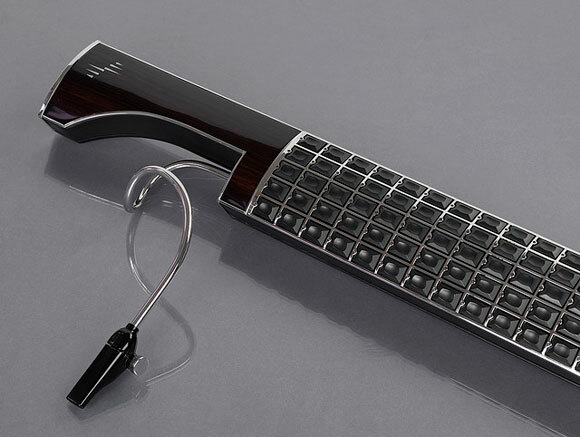 And with something as unusual as the Eigenharp – a digital music controller that looks like the love child of a bassoon and a fretboard and connects to a computer – they even necessitate new techniques and strategies. Enter musician Geert Bevin. As the creator of the fan site Eigenzone, he’s been a tireless champion of the instrument. He’s been compiling videos revealing player techniques and ideas for putting together a practical performance setup. And even Geert concedes that making music takes time. “Six to nine months seems to be the time required to become confident enough to play the Eigenharp Alpha in front of an audience,” says Geert with a smile. Inventing the technology is only half the equation: it’ll take players, and time, for that creation to come into its own. Guitars and drums and flutes have had millennia. Here’s what a few months have done for the Eigenharp. Geert shares the technical details for one video and musical performance. Some of what makes the instrument special may not be immediately apparent. He’s making use of the broad pitch area, the access afforded to a range of pitches by the key layout, and features like per-key pitch bending, per-key vibrato, and expressive details in playing the notes. 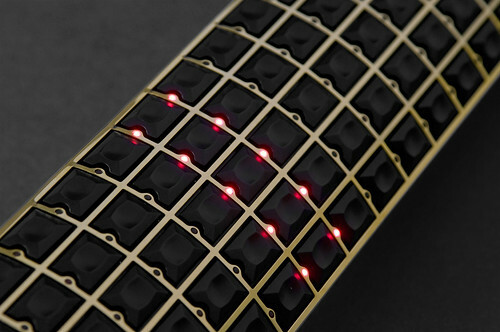 Those are then connected to a range of soft synths intelligent enough to respond to those messages, and sonically detailed enough to make some useful sounds in reply. Here’s Geert with all the gory details. As a follow-up on the Eigenharp Alpha post on CDM a few months ago, I thought I’d let you know that I finally recorded a video that I feel comfortable about pushing into the wild. It’s a rearrangement of Battestar Galactica ‘Kara remembers’ theme song for the Eigenharp Alpha. The main melody of this theme is heard by the Final Five Cylons when they’re ‘switched on’. Kara Thrace (Starbuck) tries to remember this song in the series while sitting at an old piano in a bar. When she recalls how’s being played, it explodes into a full-blown arrangement. My personal rendition of the song also starts off hesitant, inspired by Kara trying to remember the chords, the melody and the tempo. I’m using Tonehammer’s Emotional Piano for the piano in the first Eigenharp Audio Unit slot. [All the instruments] are tuned to A major; this allows me to play standard chord patterns and have them sound correct within the song’s scale. By doing that, none of the keys on the keyboard are playing any key outside of the selected scale. [In the Eigenharp’s software, you can configure that setting] on a per-instrument basis as opposed to globally, you can create your own scales, and you can also play fully chromatically. The beginning of the song is played on the third Alpha keyboard split, which provides a small rectangular area at the bottom and a single area of playing keys on the majority of the keyboard. I set up the bottom area to control the Eigenharp drum loops section, so that I can quickly change them later while playing the piano at the same time. Eigenharp, up close. Image courtesy Eigenlabs. Once I ‘remembered’ the chords and the melody, I start the Eigenharp’s metronome, which also starts the two drum loops I’ve activated by default. This gives me a sense for the rhythm of the song and I can start playing the piano part in tempo. After a few bars, it’s clear that also the rhythmical part of the song has ‘come back to me’ and I can dive into the meat of it. I do this by activating four new drum loops on the control area while playing the piano chords an octave lower with my left hand. After two measures, I press the record trigger for the active instrument on the keyboard split and play the piano chords together with the main melody for two measures. The looping automatically starts immediately after the recording. Having the accompaniment section built up, I can now switch to a first solo instrument, which is the native model of a cello. I used an Audio Unit effect [insert] on it to reduce the dynamics and to make it louder. The Softube CL-1B compressor is great for that as it also adds a touch of warmth. The cello on the Eigenharp can be bowed in a variety of ways. My preference is to use the left strip controller since it’s the closest to the real physical action of bowing on the actual instrument. While playing the cello, each course of keys acts as a string, playing only the highest note. You can thus play with a polyphony of five tones when pressing down keys on all courses. This also allows you to play smooth legato on the same course since you can leave existing fingers pressed down while adding next ones. Just as with regular strings, you can individually add vibrato to each note. At the end of the cello solo section, I use the second strip controller together with the first one to modulate the global pitch while bowing at the same time. The next section is a more atmospheric intermezzo that builds up tension before exploding into the final part. I play this on the fourth keyboard split that evenly divides the playing surface into two sections. The upper one uses the same Emotional Piano as before, together with a sweeping synth sound that comes from FabFilter Twin2 in the second Audio Unit slot of the Eigenharp [software]. The lower section only plays the piano. This allows me the play chords with sweeps using my left hand and have just a piano sound for the melody with my right hand. Note that this demonstrates that splits on the Eigenharp are merely different ways of accessing the same instruments and functionalities. All the capabilities of the Eigenharp are always active; they’re just accessed differently at different times, depending on what’s most comfortable for you while you’re playing. At the beginning of this section, I switch off the metronome and turn it on again at the end; this also switches the drums loops and recorded accompaniment off and on. When I move on to the next section, the first two measures of the drum loops don’t play the recording since I actually started playing slightly ahead of the first beat when creating it. The Eigenharp therefore only starts playing the notes at the end of the first round. This is a matter of practice and since I’m not always at the correct time while recording, I take a precaution and continue playing the chords on the keyboard while waiting for the recording to start up again. When that happens, I switch to the fifth keyboard split, which gives you access to four independent areas. The final section of the song uses Orange Tree Samples Evolution Electric Guitar Strawberry (EEG) as an instrument in the third Audio Unit slot. I play this with my right hand in the third area of the split. This is then fed into the insert Studio Devil AMP Audio Unit to provide the amplifier and effects simulation. Playing EEG with the Eigenharp feels very responsive and natural due to the precision and expression of the keys — hammer-ons and pull-offs feel just right. I’m also using per-key pitch bending, which is understood by EEG and allows you to naturally bend one note while keeping others steady (as I like doing on my regular electric guitar). I join the electrical guitar part with the cello again, played with my left hand in the second area of the keyboard split. Since my right hand is playing already, I can’t use the strip controller to bow, so I use the breath controller instead. This allows you to move the virtual bow back and forth by exhaling and inhaling. Using tonguing technique makes it possible to do create rapid bow movements, which is exactly what I’m doing when I’m playing chords on both the guitar and the cello. The end of the song plays the lead melody in unison on the guitar and the cello, I set the first split area up to have both instruments active so that I have my right hand free to turn the metronome off at the right moment. The outro simply has me using the breathpipe to wrap up the song with some soft cello notes. And other players demonstrate live performance. In this video, I am running Apple MainStage inside of which several instances of Omnisphere are running to produce string and choir sounds. Kontakt 4 is responsible for the Uillean Pipes solo. The background chords are being triggered one at a time by Max (a real-time programming language) in response to key presses by my right hand on the Eigenharp. The chord data produced by Max is sent to Apple MainStage. My left hand is playing the solo, going directly to MainStage. Lament (Caoineadh Cu Chulainn) is a beautifully haunting instrumental from Riverdance, written by Bill Whelan. I imagine not everyone here is quite ready to jump down this particular rabbit hole, but then, that’s not entirely the point. To me, it’s always fascinating to see the different ways in which people develop performance practice and set up their rig, and the extraordinary range that covers. Even if I don’t immediately resonate with what people are doing, I find there’s something to learn or take as inspiration. Let us know what you think.